One of the first restaurants I ate at when I first arrived in San Jose was East Lake Seafood Restaurant in east San Jose. It had (and continues to have) a reputation for good Chinese food at great prices. Most nights, if you go at dinnertime, their tables will be full. Same thing happens on the weekends for lunch. If you don't show up early enough, there will be a line out the door and the hostess will be telling you the wait is half an hour to 45 minutes. So why all the fuss? One reason is their jook, the humble Chinese rice porridge. Served to sick children (and adults) everywhere by Chinese mothers. But it's not just for upset tummies - it's for hungry tummies as well. East Lake does it just right. You can order it plain, but we like ours either with flounder fillet or century egg. Of course, don't ignore other dishes like their satay noodles. 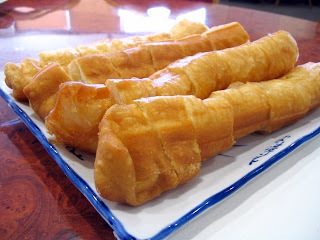 And who can forget the you tiao, Chinese donut? They come hot out of the oil, crispy and light. 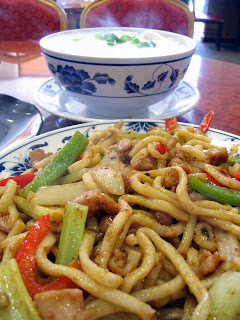 If you're looking for good and cheap Chinese food in San Jose, this is the place to go. Just show up early to avoid the crowds. The yau char kwai looks very good.